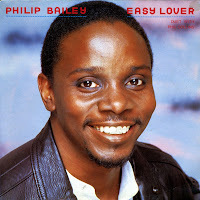 Philip Bailey was born on May 8, 1951 in Denver, Colorado (USA). He found fame by sharing lead vocal duties on songs by Earth Wind and Fire together with founder member Maurice White. When Bailey decided to record a solo album in 1984, he got Phil Collins to produce it. Their duet 'Easy lover' was released as a single in late 1984 and was a worldwide hit. It went number one in the UK and the Netherlands. During a radio interview, Phil Collins was asked how 'he discovered' Philip Bailey. Annoyed at the lack of knowledge of the interviewer Collins made up a story about how he had been filling his car with petrol when he heard the attendant singing... and that turned out to be Philip Bailey. The interviewer believed the whole story, which was soon picked up by other media.